(Nanowerk News) University of British Columbia physicists have detected 'charge ordering' in electron-doped cuprate superconductors for the first time, according to research published today in Science ("Charge ordering in the electron-doped superconductor Nd2–xCexCuO4"). "The universality of charge ordering across these very different materials shifts our perspective, and could propel future breakthroughs," says Eduardo H. da Silva Neto, a postdoctoral fellow with UBC's Quantum Matter Institute and the Max-Planck-UBC Centre for Quantum Materials, who led the experiment. 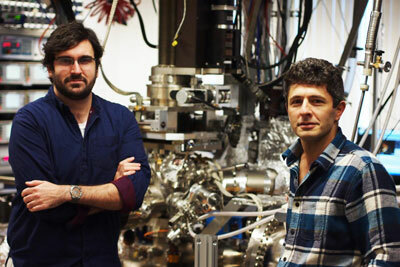 This image depicts Eduardo H. da Silva Neto and Andrea Damascelli at UBC's Quantum Matter Institute. "We need to understand how charge ordering is formed in materials and ideally tune it, allowing superconductivity to occur at temperatures closer to room temperature," adds da Silva Neto. "Our work opens up a new avenue to study charge ordering and the mysteries of superconductivity in these materials," says UBC professor Andrea Damascelli, leader of the research team. "Now we can compare and contrast characteristics that are common across both flavours of copper-based materials -- both hole- and electron-doped." Doping involves adding impurities (electrons or 'holes') into materials in order to spur the material to exhibit unusual behaviours such as high-temperature superconductivity. Superconductivity -- the phenomenon of electricity flowing with no resistance -- occurs in some materials at very low temperatures. High-temperature cuprate superconductors are capable of conducting electricity without resistance at record temperatures, higher than the boiling point of liquid nitrogen. Because of their unrivalled characteristics, they represent the best candidates to advance current superconductor technology, which includes a broad range of applications such as: quantum computers, MRI, high-precision magnetometry, levitating high-speed trains, and lossless power lines.